One thing that never ceases to bring a smile to my face is to find out that someone I like or admire happens to be a tabletop gamer, and never more so when that person speaks out in favor of my favorite hobby and pastime: roleplaying games. 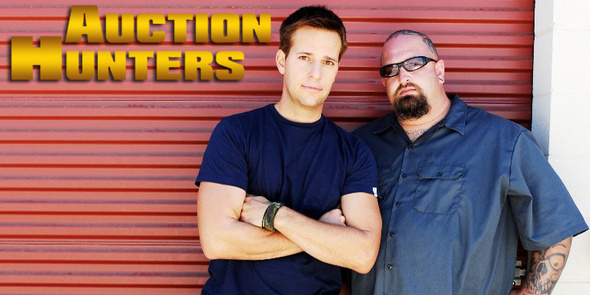 Allen Haff and Ton Jones are… the AUCTION HUNTERS! I happen to be a big fan of a television show on Spike TV called Auction Hunters. 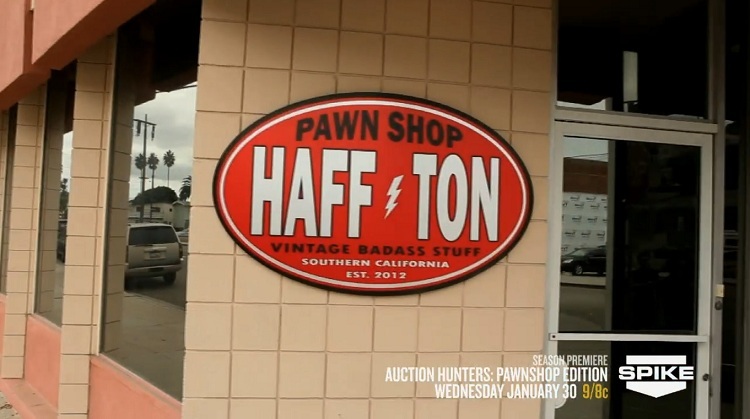 In this show, Allen Haff and his partner Ton Jones bid on storage locker auctions, investigating the contents for cool and unusual items and then selling those items on camera. 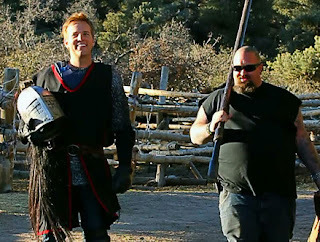 Auction Hunters is in its fourth season this year, and I happened to catch the second episode, entitled “Win, Lose, or Joust.” In this episode, the Auction Hunters find some hand-crafted jousting gear, including lances, armor, and a shield inside a storage locker. Allen Haff was very excited about this find, and he explained to Ton how he used to play Dungeons and Dragons, how “it kept him out of jail,” and how he played characters who were knights and paladins. Later in the episode, Allen gets a chance to use the jousting gear in a real joust… and although he gets unhorsed, Allen is obviously having the time of his life. Allen is suited up here ready to joust. It was one hell of a ride! It was very inspiring to me when I watched this episode, so I reached out to Allen on facebook to see if he’d be willing to talk to me about both the show and his history with roleplaying games. Allen told me that he had played RPGs throughout high school and into college, and in fact, one of his cousins had hooked up his gaming group with advance products from Mayfair. RW: Have you ever found gaming memorabilia, gaming collections, or gamer stuff in a storage locker that we haven’t seen on the show? I know you guys mostly throw out books, but you never know, right? AH: Actually we donate most contemporary books but sell our first edition older books online. I’ve found and kept an original D&D basic box set in mint condition, plus i’ve accumulated all of the AD &D manuals even though I’m not playing anymore. It’s nice to look through them once in awhile. Growing up there wasn’t an abundance of disposable income around my house so it was my friend who had all the cool AD&D stuff and Star Wars action figures. But that’s why it’s such a great game, it doesn’t cost money for hours of endless entertainment and our parents were glad we weren’t out running in the streets or driving around looking for trouble. That’s why I say it kept me out prison. The more you play with the same group of guys the better you know each other and it’s reminds me of playing in a rock band. You got your bandleader (DM) picking the songs and then each of the players work together to make it work. Once in awhile you take a solo and raise the stakes and I remember a few of those sessions. Nothing like pulling double damage out when you are conducting a raid on the Thieves’ Guild. I only played into my college years with the same super creative group of childhood buddies and our level of play was pretty advanced so I doubt I would have liked playing with the game with new people. RW: Would you say that there are things you learned from your gaming experience that helps you plunder the treasure troves of the storage lockers we see on the show? If so, what are they and why? AH: Gaming groups learn teamwork and to compliment each other, like my business partner and I do. Everyone has different strengths and areas of expertise. D&D and a few other RPG’s helped me learn to use my imagination for the good of the group and to critically think about how to deal with challenges. We had to improv and act out what our characters were doing, and this may have contributed to me being even faster on feet. 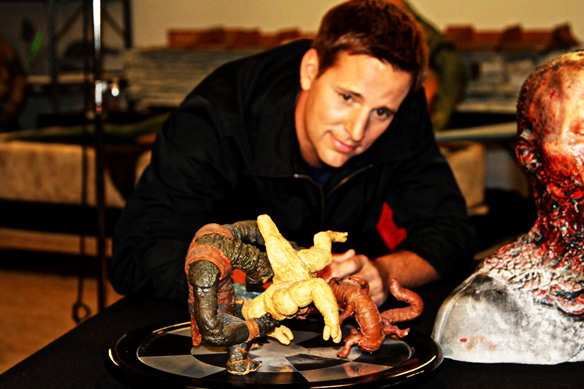 Allen Haff, entrepeneur, auction hunter, tv celebrity, gamer! RW: What are or were your favorite roleplaying games? With a Mayfair connection I’m sure you’ve seen things like Chill, the DC Heroes RPG, and possibly some of the Role Aids products or Underground. AH: DC Heroes was our second favorite game after D&D and I got this game a year before anyone else had it. Star Frontiers and there was also a spy game but the name now escapes me. (Ross’ note: I think Allen may be describing Top Secret here) I even got some D&D modules up until TSR sued Mayfair for copyright infringement. RW: Can you tell us a bit about your favorite role-playing game memories, and how you got into the hobby? Do you still get a chance to sling dice with your friends? If you could play an RPG right now, what character would you play and why? AH: I haven’t played since college but you have to understand I started playing AD &D when I was 9 years. it pleases me that my buddy who’s cousin taught us the game still plays games to day and online computer stuff. he’s got a lot more time than I do now and with everything I’m into there just isn’t time. Maybe we’ll do a reunion game night when we’re old and retired. The Haff Ton pawn shop, a new feature for Season Four. AH: It’s expensive! We’re both exhausted with all of the extra work and stress and it is taking a toll on us. You’ll see how we deal with that stress and hopefully meet the new challenges to make even more money this year. Thanks to the store though I JUST BOUGHT AN ORIGINAL STAR WARS COLLECTION AND AN ORIGINAL BOBA FETT STILL IN THE CARD worth $2500. A. How excited you and Ton get when you find something really cool. AH: Thank you. We love what we do. RW: B. How you always try out what you find and get cash for it right then when you sell it on camera. That’s unique! 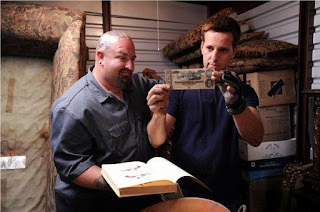 Allen and Ton investigate some buried treasure. AH: That’s the fun part, which is why it makes the cut. No one wants to see us use that vintage china tea service for high tea, but we still make a lot of money on the more conventional antiques we find. Thank you!